Happy 56th Birthday to our 44th President, Barack Hussein Obama II. He is the first African American elected to serve as President of the United StateS of America (2008 - 2017). Obama was born in Honolulu, Hawaii in 1961. He graduated from Columbia in 1983. Later on that decade he in enrolled in Harvard Law School where he became the first black president of the Harvard Law Review. After graduation, he became a civil rights attorney and professor, and taught Constitutional Law at the University of Chicago Law School from 1992 to 2004. He has been married to his beautiful wife, Michelle, since 1992. They have 2 gorgeous daughters, Malia and Sasha. Obama has written 3 books so far; Dreams from My Father (1995), The Audacity of Hope (2006), and Of Thee I Sing (2010). Obama speaks some basic Indonesian, having learned the language during his childhood years in Jakarta. He plays basketball, a sport he participated in as a member of his high school's varsity team; he is left-handed. He is a supporter of all Chicago professional teams. Bulls, Bears, Blackhawks, and the White Sox (shoutout to the Southside). 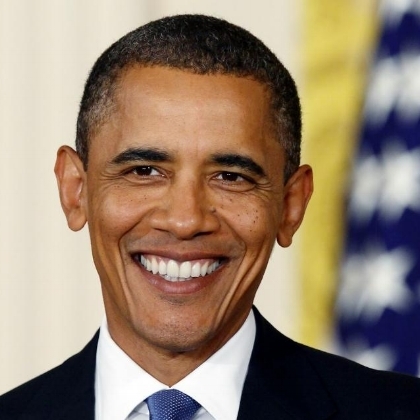 Today we acknowledge and celebrate President Barack Obama on his day. Happy Birthday my brother!